The Sikorsky CH-53E Super Stallion is a heavy-lift helicopter operated by the United States military. As the Sikorsky S-80 it was developed from the CH-53 Sea Stallion, mainly by adding a third engine, adding a seventh blade to the main rotor and canting the tail rotor 20 degrees. It was built by Sikorsky Aircraft for the United States Marine Corps. The less common MH-53E Sea Dragon fills the United States Navy's need for long range minesweeping or Airborne Mine Countermeasures (AMCM) missions, and perform heavy-lift duties for the Navy. Under development is the Sikorsky CH-53K King Stallion, which has new engines, new composite material rotor blades, and a wider aircraft cabin; this is to replace the CH-53E. The CH-53 was the product of the U.S. Marines' "Heavy Helicopter Experimental" (HH(X)) competition begun in 1962. Sikorsky's S-65 was selected over Boeing Vertol's modified CH-47 Chinook version. The prototype YCH-53A first flew on 14 October 1964. The helicopter was designated "CH-53A Sea Stallion" and delivery of production helicopters began in 1966. The first CH-53As were powered by two General Electric T64-GE-6 turboshaft engines with 2,850 shp (2,125 kW) and had a maximum gross weight of 46,000 lb (20,865 kg) including 20,000 lb (9,072 kg) in payload. The US Air Force's HH-53B/C "Super Jolly Green Giant" were for special operations and combat rescue and were first deployed during the Vietnam War. The Air Force's MH-53H/J/M Pave Low helicopters were the last of the twin engined H-53s and were equipped with extensive avionics upgrades for all weather operation. In October 1967, the US Marine Corps issued a requirement for a helicopter with a lifting capacity 1.8 times that of the CH-53D that would fit on amphibious warfare ships. The US Navy and US Army were also seeking similar helicopters at the time. Before issue of the requirement Sikorsky had been working on an enhancement to the CH-53D, under the company designation "S-80", featuring a third turboshaft engine and a more powerful rotor system. Sikorsky proposed the S-80 design to the Marines in 1968. The Marines liked the idea since it promised to deliver a good solution quickly, and funded development of a testbed helicopter for evaluation. In 1970, against pressure by the US Defense Secretary to take the Boeing Vertol XCH-62 being developed for the Army, the Navy and Marines were able to show the Army's helicopter was too large to operate on landing ships and were allowed to pursue their helicopter. Prototype testing investigated the addition of a third engine and a larger rotor system with a seventh blade in the early 1970s. In 1974, the initial YCH-53E first flew. The Navy requested a version of the CH-53E for the airborne mine countermeasures role, designated "MH-53E Sea Dragon". It has enlarged sponsons to provide substantially greater fuel storage and endurance. It also retained the in-flight refueling probe, and could be fitted with up to seven 300 US gallon (1,136 liter) ferry tanks internally. The MH-53E digital flight-control system includes features specifically designed to help tow minesweeping gear. The prototype MH-53E made its first flight on 23 December 1981. MH-53E was used by the Navy beginning in 1986. The MH-53E is capable of in-flight refueling and can be refueled at hover. The US Marine Corps had been planning to upgrade most of their CH-53Es to keep them in service, but this plan stalled. 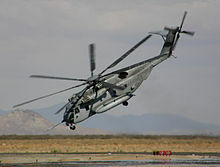 Sikorsky then proposed a new version, originally the "CH-53X", and in April 2006, the USMC signed a contract for 156 aircraft as the "CH-53K". The Marines are planning to start retiring CH-53Es in 2009 and need new helicopters very quickly. The CH-53E as designed to transport up to 55 troops or 30,000 lb (13,610 kg) of cargo and can carry external slung loads up to 36,000 lb (16,330 kg). The CH-53E has incorporated the same crash attenuating seats as the MV-22B to increase survivability of passengers but at a cost of reducing its original troop transport capacity. The Super Stallion has a cruise speed of 173 mph (278 km/h) and a range of 621 miles (1,000 km). The helicopter is fitted with a forward extendable in-flight refueling probe and it can also hoist hose refuel from a surface ship while in hover mode. It can carry three machine guns: one at the starboard side crew door; one at the port window, just behind the copilot; and one at the tail ramp. The CH-53E also has chaff-flare dispensers. The CH-53E and the MH-53E are the largest helicopters in the Western world, while the CH-53K now being developed will be even larger. They are fourth in the world to the Russian Mil Mi-26 Halo single-rotor helicopter and the enormous, twin transverse rotored Mil V-12 Homer, which can lift more than 22 tons (20 tonnes) and 44 tons (40 tonnes), respectively and the Mi-26's single-rotor predecessor Mil Mi-6, which has less payload (12 tonnes) but is bigger and has a higher MTOW at 42 tonnes. USMC CH-53E recovering a disabled US Army CH-47 Chinook in eastern Afghanistan, 2010. The Marine Corps CH-53E saw its first shipboard deployment in 1983 when four CH-53E helicopters from HMH-464 deployed aboard USS Iwo Jima as part of the 24th Marine Amphibious Unit (24th MAU). During this deployment Marines were sent ashore in Beirut, Lebanon as peace keepers and established perimeters at and near the Beirut International Airport. On 23 October 1983, a truck bomb detonated by terrorists destroyed the Marine barracks in Beirut, killing nearly 240 service members as they slept. CH-53E helicopters from the 24th MAU provided critical combat support during this operation. On 8 June 1995, Captain Scott O'Grady, an F-16 Fighting Falcon pilot shot down over Bosnia, was rescued by two CH-53Es. On 26 October 2001, three CH-53Es aboard USS Peleliu and three CH-53Es aboard USS Bataan flew 550 miles (890 km) to secure the first land base in Afghanistan, Camp Rhino, with 1100 troops at its peak. This amphibious raid is the longest amphibious raid in history. The long range capability of the CH-53Es enabled Marines to establish a southern base in Afghanistan, putting the war on the ground. Currently, about 150 CH-53E helicopters are in service with the Marines and another 28 MH-53Es are in service with the U.S Navy. The CH-53 requires 44 maintenance hours per flight hour. A flight hour costs about $20,000. A Japan Maritime Self-Defense Force MH-53E Sea Dragon lands aboard USS Tortuga in 2011. Between 1969-1990, more than 200 servicemen were killed in accidents involving the CH-53A, CH-53D and CH-53E. The MH-53E Sea Dragon is the U.S. Navy's helicopter most prone to accidents, with 27 deaths from 1984 to 2008. During that timeframe, its rate of Class A mishaps, meaning serious damage or loss of life, was 5.96 per 100,000 flight hours, more than twice the Navy helicopter average of 2.26. A 2005 lawsuit alleges that since 1993, there were at least 16 in-flight fires or thermal incidents involving the No. 2 engine on Super Stallion helicopters. The suit claims that proper changes were not made, nor were crews instructed on emergency techniques. On 1 June 1984, a CH-53E based at Tustin was lifting a truck from the deck of a ship during an exercise when a sling attached to the truck broke. This sent a shock wave into the aircraft and caused major damage. Four crew members died in the accident. On 19 November 1984, a CH-53E on a routine training mission at Camp Lejeune, NC, was lifting a seven-ton howitzer before it crashed. Six people were killed, and 11 injured. It experienced a loss of tail rotor function, lost control and impacted the ground. The cabin area was quickly consumed by the ensuing fire. On 13 July 1985, a CH-53E from a Tustin squadron was on a flight in Okinawa when it struck a logging cable and exploded. Four people were killed. On 25 August 1985, a CH-53E from New River, NC, was flying a routine supply and passenger run from Tustin to Twentynine Palms during a training operation when it caught fire and crashed in Laguna Hills. One of the three crew members was killed and the aircraft was a total loss. On 9 May 1986, a CH-53E crashed during training exercises near Twentynine Palms, killing four Marines and injuring another. The accident was the Super Stallion's fifth crash in two-year period. On 8 January 1987, a Marine Corps CH-53E crashed while practicing night landings for troop deployment at the Salton Sea Test Range. All five crew members were killed. On 9 May 1996, a CH-53E crashed at Sikorsky's Stratford plant, killing four employees on board. This led to the Navy grounding all CH-53Es and MH-53Es. On 10 August 2000, a MH-53E Sea Dragon crashed in the Gulf of Mexico near Corpus Christi and resulted in the deaths of four of the six crew members. The helicopters were later returned to service with improved swash plate duplex bearings and new warning systems for the bearings. On 20 January 2002, a CH-53E crash in Afghanistan killed two crew members and injured five others. Defense Department officials said the early-morning crash was the result of mechanical problems with the helicopter. On 2 April 2002, a Navy MH-53E (BuNo 163051) of HM-14 crashed on the runway at Bahrain International Airport. All 18 people on board survived with only a few cases of minor injuries. On 27 June 2002, a Navy MH-53E Sea Dragon of Helicopter Combat Support Squadron 4 (HC-4) "Black Stallions" crashed in a hard landing at NAS Sigonella, Sicily. No one was injured, but the aircraft was written off. On 16 July 2003, a Navy MH-53E Sea Dragon of Helicopter Combat Support Squadron 4 (HC-4) "Black Stallions" crashed near the town of Palagonia, about 10 miles west-southwest of Naval Air Station Sigonella, killing the four member crew. The flight was on a routine training mission. On 26 January 2005, a CH-53E carrying 30 Marines and one Navy Corpsman crashed in Al-Anbar province near Rutbah, Iraq, killing all 31 on board. A sandstorm was determined as the cause of the accident. The crash was part of the deadliest day of the Iraq War in terms of US fatalities. On 16 February 2005, an MH-53E from Helicopter Combat Support Squadron 4 (HC-4), based at Naval Air Station Sigonella, Sicily, crashed on the base, injuring the four crew members. On 17 February 2006, two CH-53Es carrying a combined U.S. Marine Corps and Air Force crew collided during a training mission over the Gulf of Aden, resulting in ten deaths and two injuries. On 16 January 2008, a Navy MH-53E on a routine training mission crashed approximately four miles south of Corpus Christi, Texas. Three crew members died in the crash and one crew member was treated at a local hospital. On 29 June 2012, a Navy MH-53E from HM-14 made an emergency landing five miles northeast of Pohang, South Korea due to an in-flight fire. Though the pilots and aircrew were uninjured, the aircraft was heavily damaged by the fire. On 19 July 2012 a Navy MH-53E crashed 58 miles south of Muscat, Oman during a heavy lift operation, resulting in two deaths. On 8 January 2014, a US Navy MH-53E Sea Dragon crashed in the Atlantic 18 nautical miles east of Cape Henry, Virginia with five crew members on board. Three crew members perished in the mishap. On 1 September 2014, a US Marine CH-53E of the 22nd Marine Expeditionary Unit crashed in the Gulf of Aden while attempting to land on the USS Mesa Verde following training operations in Djibouti. All 17 Marines and 8 sailors on board were rescued. On 14 January 2016, two US Marine CH-53Es on a night time training exercise off the coast of Hawaii collided with each other, resulting in the loss of both aircraft and death of their 12 crew members; each CH-53E was carrying a crew of six. On 11 October 2017, a US Marine Corps CH-53E based at Marine Corps Air Station Futenma crashed in the Takae district of Higashi village in Okinawa. A fire broke out in one of the helicopter's engines forcing a crash-landing 300 meters from homes. After the landing the helicopter was destroyed by fire. No one was injured in the accident. This led the US military to ground CH-53E aircraft in Japan, and for the Japanese government to call for an indefinite grounding. This caused anger along some local people and displeasure from the Japanese government after flights were resumed a week later. On 3 April 2018, a USMC CH-53E of the 3rd Marine Aircraft Wing crashed near Plaster City, California killing 4 Marines. A MH-53E towing the MK105 minesweeping sled. ^ a b Sikorsky Giant Helicopters: S-64, S-65, & S-80 Archived 16 February 2010 at the Wayback Machine, Vectorsite.net, 1 December 2009. ^ a b Frawley, Gerard. The International Directory of Military Aircraft, p. 148. Aerospace Publications Pty Ltd, 2002. ISBN 1-875671-55-2. ^ a b c d e f g h i j k S-80 Origins / US Marine & Navy Service / Japanese Service Archived 26 June 2010 at the Wayback Machine. Vectorsite.net, 1 December 2009. ^ a b c d e "CH-53A/D/E Sea Stallion AND MH-53E Sea Dragon" Archived 6 February 1997 at the Wayback Machine. US Navy, 15 November 2000. ^ Head, Elan (2017). "Meet the King". p. 47. Archived from the original on 8 September 2017. Retrieved 22 January 2017. ^ "Sikorsky Awarded $3.0B Development Contract For Marine Corps CH-53K Heavy-Lift Helicopter" Archived 27 November 2008 at the Wayback Machine. Sikorsky Aircraft, 5 April 2006. ^ "Sikorsky Aircraft Marks Start of CH-53K Development and Demonstration Phase" Archived 27 November 2008 at the Wayback Machine. Sikorsky Aircraft, 17 April 2006. ^ S-80 Upgrades / CH-53K Archived 16 December 2008 at the Wayback Machine. Vectorsite.net, 1 December 2009. ^ "Marines Up Order for New Heavy Lifter" Archived 1 July 2012 at Archive.today, "Rotor & Wing", 1 August 2007. ^ "US Marines in desperate need of new CH-53K" Archived 16 December 2008 at the Wayback Machine. Flight Daily News, 21 June 2007. ^ CH-53D/E page Archived 9 November 2006 at the Wayback Machine. USMC. Accessed 3 November 2007. ^ Siegel, Adam (October 1991). "Eastern Exit: The Noncombatant Evacuation Operation (NEO) From Mogadishu, Somalia in January 1991" (PDF). Center for Naval Analyses. Alexandria, Virginia: Center for Naval Analyses. Archived from the original (PDF) on 26 February 2015. Retrieved 26 February 2015. ^ Whittle, Richard. USMC CH-53E Costs Rise With Op Tempo Archived 2 May 2014 at the Wayback Machine Rotor & Wing, Aviation Today, January 2007. Accessed: 15 March 2012. Quote: For every hour the Corps flies a -53E, it spends 44 maintenance hours fixing it. Every hour a Super Stallion flies it costs about $20,000. ^ a b c "World Air Forces 2013" (PDF). Flightglobal Insight. 2013. Archived (PDF) from the original on 2 November 2013. Retrieved 5 April 2013. ^ "Squadron HMH-361". globalsecurity.org. Archived from the original on 22 January 2013. Retrieved 5 April 2013. ^ "HMH-366 Crew chief from Cherry Point reaches milestone". marines.mil. Archived from the original on 23 February 2013. Retrieved 5 April 2013. ^ "Squadron HMH-461". globalsecurity.org. Archived from the original on 3 February 2013. Retrieved 5 April 2013. ^ "Squadron HMH-462". globalsecurity.org. Archived from the original on 5 November 2012. Retrieved 5 April 2013. ^ "Squadron HMH-464". globalsecurity.org. Archived from the original on 12 November 2012. Retrieved 5 April 2013. ^ "Marine Heavy Helicopter Squadron 465". marines.mil. Archived from the original on 19 February 2013. Retrieved 5 April 2013. ^ "HMH-466 "Wolfpack"". tripod.com. Archived from the original on 8 August 2014. Retrieved 5 April 2013. ^ "Squadron HMH-769". globalsecurity.org. Archived from the original on 12 October 2012. Retrieved 5 April 2013. ^ "Squadron HMH-772". globalsecurity.org. Archived from the original on 8 August 2014. Retrieved 5 April 2013. ^ "Helicopter Combat Support Squadron 14". globalsecurity.org. Archived from the original on 25 October 2012. Retrieved 5 April 2013. ^ "Helicopter Combat Support Squadron 15". globalsecurity.org. Archived from the original on 22 January 2013. Retrieved 5 April 2013. ^ "Helicopter Crash Kills 1 Marine, Injures 5". Archived from the original on 7 April 2015. Retrieved 8 June 2012. ^ "MH-53 twice as crash-prone as other copters". Navy Times. Associated Press. 21 January 2008. Archived from the original on 5 September 2012. ^ a b "Suit blames Sikorsky, GE in air crash" Archived 25 November 2010 at the Wayback Machine. koskoff.com, 16 July 2005. ^ "Sikorsky, We Have A Problem". ctnewsjunkie.com, 2 August 2005. ^ a b c d "A History of CH-53E Incidents". 15 February 1987. Archived from the original on 5 September 2014. Retrieved 8 June 2012. ^ "Brothers Killed in Action in USMC Helicopters". Archived from the original on 8 January 2014. ^ "Laguna Hills Helicopter Crash Kills 1, Injures 4 : Marine Super Stallion Ignites One-Acre Grass Fire When It Goes Down in Field". Archived from the original on 5 September 2014. Retrieved 8 June 2012. ^ "Officials Identify Marines Killed, Hurt in Twentynine Palms Helicopter Crash". Archived from the original on 5 September 2014. Retrieved 8 June 2012. ^ "Marine Copter Crashes; All 5 on Board Die". Archived from the original on 5 September 2014. Retrieved 8 June 2012. ^ Sherman, Christopher. "Copter in crash has spotty record". Associated Press via theeagle.com, 19 January 2008. ^ "Copters airborne after grounding". Amarillo Globe-News. Archived from the original on 4 March 2016. Retrieved 9 October 2015. ^ "Copter Crash Deals Another Blow to San Diego Marines". Archived from the original on 5 September 2014. Retrieved 8 June 2012. ^ a b "US Navy and US Marine Corps BuNos". joebaugher.com. Archived from the original on 28 April 2012. ^ a b "Victims of Sigonella crash found". Stars and Stripes. Archived from the original on 9 March 2012. ^ "Sigonella pays tribute to four victims of Sea Dragon crash". Stars and Stripes. Archived from the original on 9 March 2012. ^ "Worst US air losses in Iraq" Archived 6 January 2008 at the Wayback Machine. The Telegraph, 22 August 2007. ^ "Iraq air crash kills 31 US troops" Archived 16 March 2007 at the Wayback Machine. BBC, 26 January 2005. ^ "Deadliest day for U.S. in Iraq war" Archived 19 April 2009 at the Wayback Machine. CNN, 27 January 2005. ^ "Archived copy". Archived from the original on 16 October 2012. Retrieved 30 August 2011. CS1 maint: Archived copy as title (link). ^ "10 U.S. troops accounted for after crash off Djibouti". The Arizona Republic. 19 February 2006. Archived from the original on 21 July 2012. Retrieved 15 June 2011. ^ "Combined Joint Task Force — Horn of Africa members honor fallen brethren". Defense Video & Imagery Distribution System. 13 November 2009. Archived from the original on 26 August 2012. Retrieved 15 June 2011. ^ "MH-53E Sea Dragon Crashes South of Corpus Christi" Archived 21 March 2008 at the Wayback Machine. US Navy, 17 January 2008. ^ "Navy MH-53 Helicopter Makes Emergency Landing" Archived 1 July 2012 at the Wayback Machine. US Navy, 29 June 2012. ^ "MH-53 Helicopter Suffers Aviation Mishap, Crashes" Archived 24 July 2012 at the Wayback Machine. US Navy, 19 July 2012. ^ "1 still missing in Navy copter crash that killed 2". MSN News. Associated Press. 9 January 2014. Archived from the original on 9 January 2014. Retrieved 9 January 2014. ^ Lewis, Paul (8 January 2014). "US navy helicopter goes down off Virginia coast". The Guardian. Archived from the original on 8 January 2014. Retrieved 8 January 2014. ^ U.S. News (27 September 2015). "Two crewmen dead after Navy helicopter goes down off Va.; one missing". NBC News. Archived from the original on 8 January 2014. ^ "U.S. military personnel rescued at sea after helicopter crash near Djibouti". CNN. CNN. 1 September 2014. Archived from the original on 2 September 2014. Retrieved 1 September 2014. 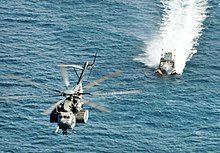 ^ "Helicopter crash in Hawaii: Search for 12 missing Marines". CNN. Archived from the original on 15 January 2016. Retrieved 16 January 2016. ^ Rich, Motoko (11 October 2017). "U.S. Helicopter Crashes on Okinawa, Adding to Safety Concerns". New York Times. Retrieved 13 October 2017. ^ "U.S. military to ground CH-53 helicopters after accident in Okinawa". Kyodo News. 12 October 2017. Retrieved 13 October 2017. ^ "US general denies agreeing with Japanese defense minister on chopper grounding". Mainichi Shimbun. 14 October 2017. Retrieved 14 October 2017. ^ "Japan wants U.S. choppers grounded as accident in Okinawa leaves LDP reeling ahead of election". Japan Times. 14 October 2017. Retrieved 14 October 2017. ^ "Okinawans incensed at resumption of CH-53E chopper flights 1 week after crash". Mainichi Shimbun. 18 October 2017. Retrieved 18 October 2017. ^ "US military resumes chopper flights amid safety fears after accident". Mainichi Shimbun. 18 October 2017. Archived from the original on 18 October 2017. Retrieved 18 October 2017. ^ Scott, Neuman (4 April 2018). "Marine Helicopter Crashes In Southern California; 4 Presumed Dead". NPR. Retrieved 4 April 2018. ^ CNN, Joe Sutton,. "Marine helicopter crashes in California and kills 4". CNN. Retrieved 4 April 2018. ^ CH-53A/D/E Sea Stallion and MH-53E Sea Dragon Archived 6 February 1997 at the Wayback Machine, US Navy. ^ Donald, David ed. "Sikorsky S-65", The Complete Encyclopedia of World Aircraft. Barnes & Nobel Books, 1997. ISBN 0-7607-0592-5. ^ "About the GE T64 Archived 13 April 2014 at the Wayback Machine" BGA-aeroweb, May 17, 2012. Accessed: April 10, 2014. ^ CH-53E NATOPS Flight Manual. NAVAIR. 14 June 2017. 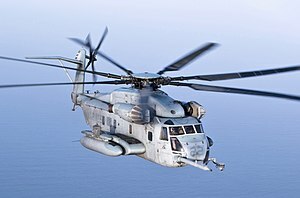 Wikimedia Commons has media related to Sikorsky CH-53E Super Stallion. This page was last edited on 8 February 2019, at 21:27 (UTC).